""Reconciliation is a term of wide scope and various application, and it is hardly possible to conceive a life or a religion which should dispense with it. There is always some kind of strain or tension between man and his environment, and man has always an interest in overcoming the strain, in resolving the discord in his situation into a harmony, in getting the environment to be his ally rather than his adversary. The process by which his end is attained may be described as one of reconciliation, but whether the reconciliation is adequate depends on whether his conception of the environment is equal to the truth. Men may be very dimly and imperfectly conscious of the nature of the strain which disquiets their life, and may seek to overcome it in blind and insufficient ways. They may interpret it as physical in its origin when it is really ethical, or as the misapprehension of a moral order when it is really antagonism to a personal God, and in either case the reconciliation they seek will fail to give the peace of which they are in quest. Nevertheless, reconciliation and nothing else is what they want, and its place in religion is central and vital."" --From Chapter 1: The Experimental Basis of the Doctrine James Denney (1856-1917) was a Scottish theologian and preacher. He is probably best known today for his defense of the doctrine of Penal Substitution. 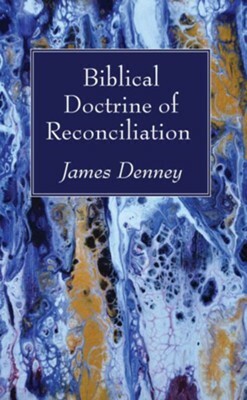 Denney was appointed Professor of Systematic Theology at his old alma mater, Free Church College Glasgow, in 1897, and spent the rest of his life teaching there. In 1900 he transferred to Professor Bruce's old Chair of New Testament Language and Literature, which he held until his death in 1917. I'm the author/artist and I want to review Biblical Doctrine of Reconciliation.